The United States has ordered all non-emergency personnel out of Venezuela after President Nicolas Maduro appeared in parliament to declare closure of consulates in America. The US State Department said Thursday all non-emergency government employees should depart Venezuela and US citizens ‘residing or traveling in Venezuela’ were also warned that they ‘should strongly consider departing’. Venezuela earlier said it will close its embassy and all consulates in the United States, one day after Maduro broke off diplomatic relations in response to U.S. recognition of an opposition leader as interim president. 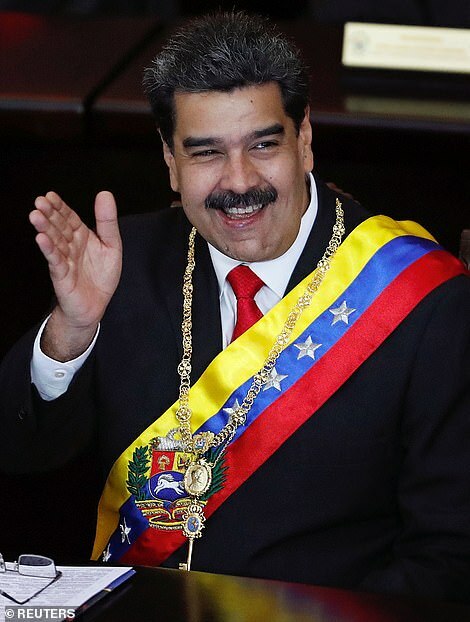 In a speech, Maduro added that he agreed with a call by Mexico and Uruguay for dialogue between Venezuela’s government and opposition for a resolution to the South American country’s political crisis. 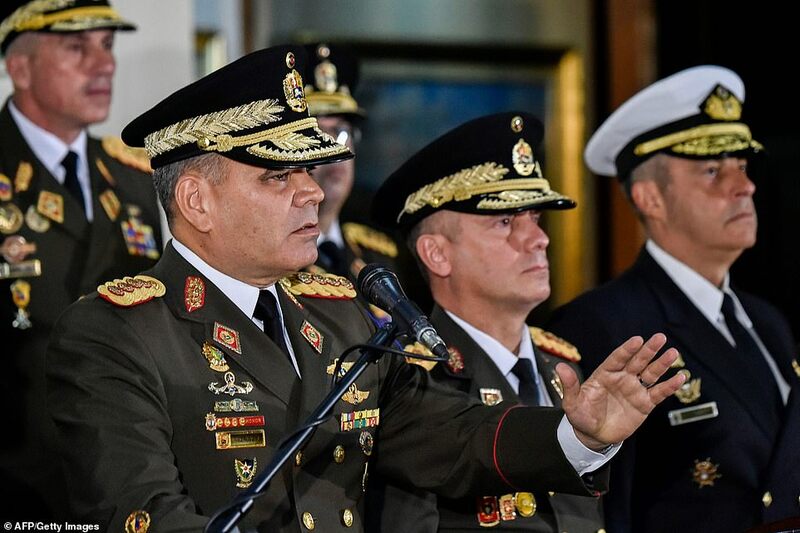 Venezuela’s powerful military high command threw its weight behind President Nicolas Maduro on Thursday as opposition leader Juan Guaido pressed a direct challenge to his authority with the backing of the United States and key Latin American allies. 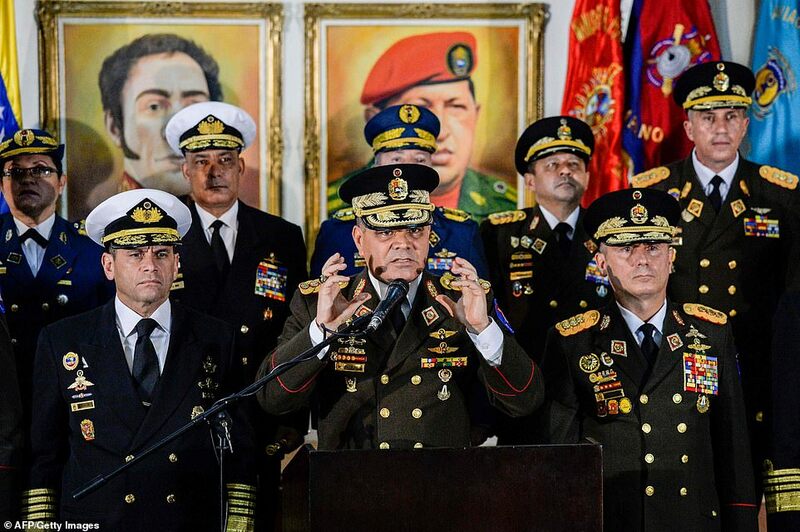 Eight generals who command of strategic regions of the country reiterated their ‘absolute loyalty and subordination’ to the socialist leader in messages carried on state television. 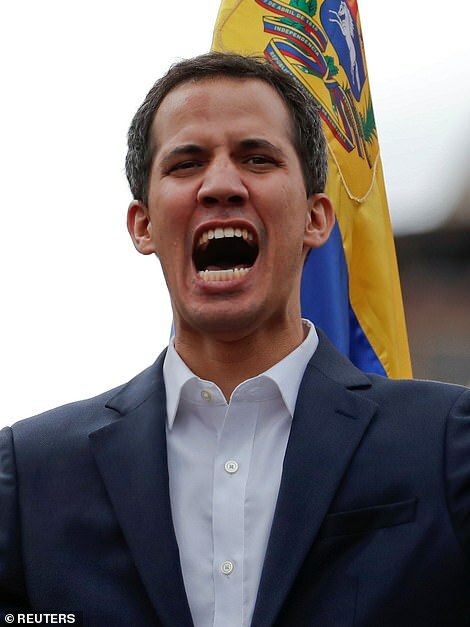 Meanwhile Venezuelan opposition leader Juan Guaido says he would consider granting amnesty to President Nicolas Maduro and his allies if they helped return Venezuela to democracy. 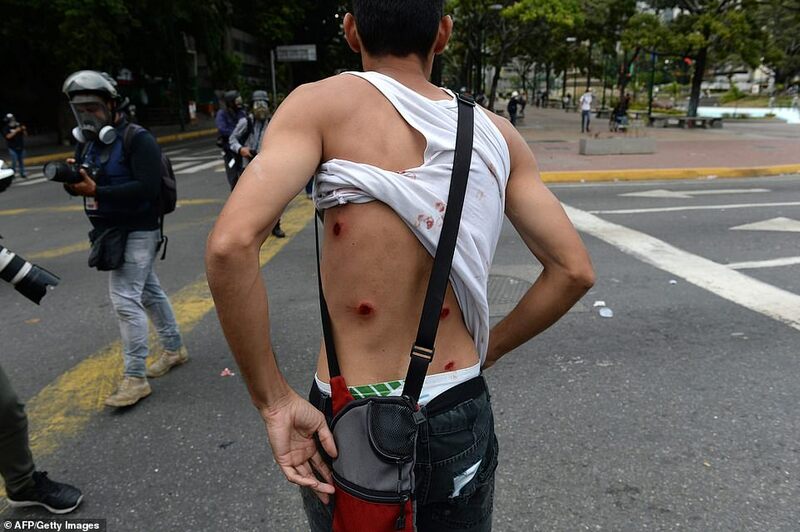 In Washington, US Secretary of State Mike Pompeo warned the Maduro government against the use of force against demonstrators in a speech to the Organization of American States. ‘The time for debate is done. The regime of former president Nicolas Maduro is illegitimate,’ Pompeo said. Guaido, 35, set the showdown in motion Wednesday by proclaiming himself ‘acting president’ and was swiftly recognized by the United States and about a dozen regional governments, including those of Brazil, Argentina and Colombia. Mexico, Cuba and Bolivia, all in the hands of leftist governments, pledged support for Maduro. 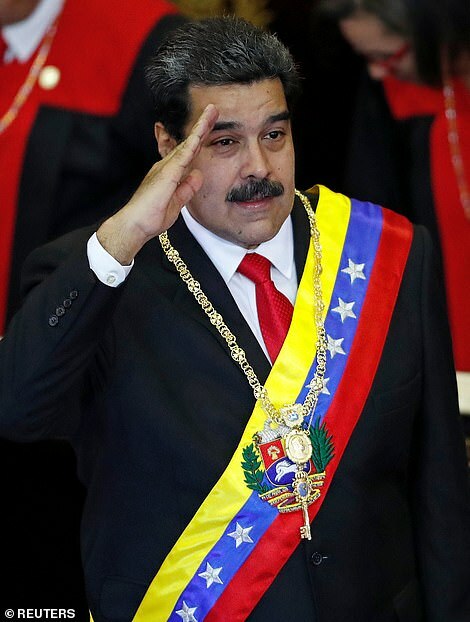 Further afield, Maduro received support from allies Russia and China while France and Canada backed Guaido. Russian President Vladimir Putin offered his support in a phone call. Mr Putin ‘expressed support to the legitimate government of Venezuela amid the acute political crisis that has been provoked from the outside’, the Kremlin said. 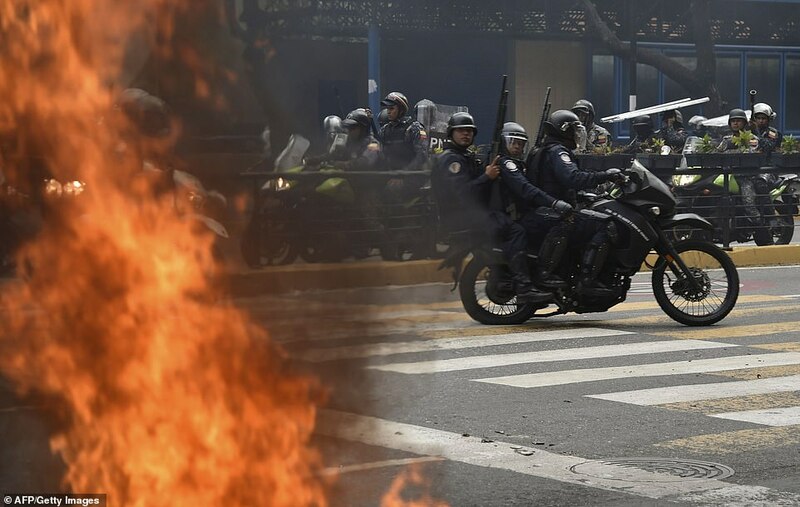 Guaido’s bold move came amid a fresh wave of deadly street clashes between protesters and security forces in this oil-rich but economically devastated country. 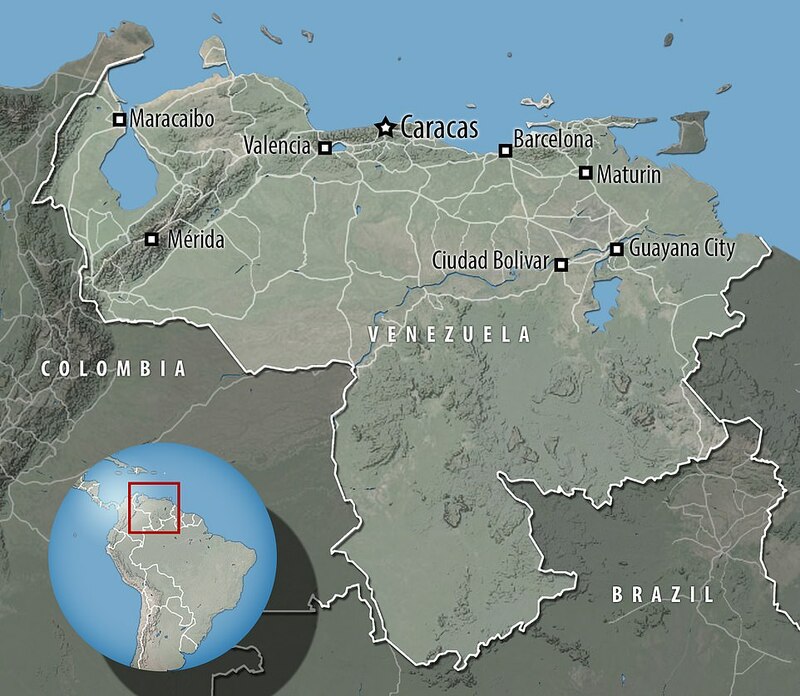 A deep depression marked by hyperinflation and shortages of food and medicine has triggered an exodus of Venezuelans to surrounding countries. 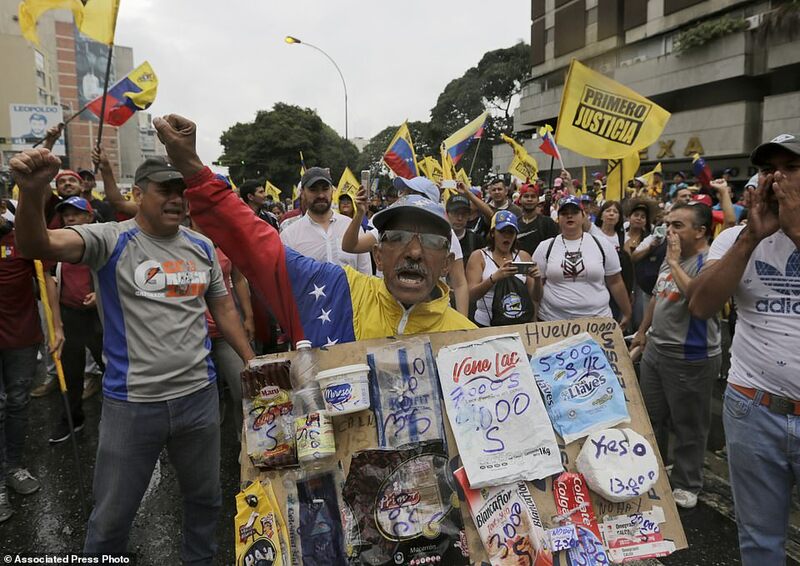 Tens of thousands of Venezuelans took to the streets on Wednesday – on the 61st anniversary of the fall of the Marcos Perez Jimenez dictatorship – in rival rallies opposing and supporting the regime. 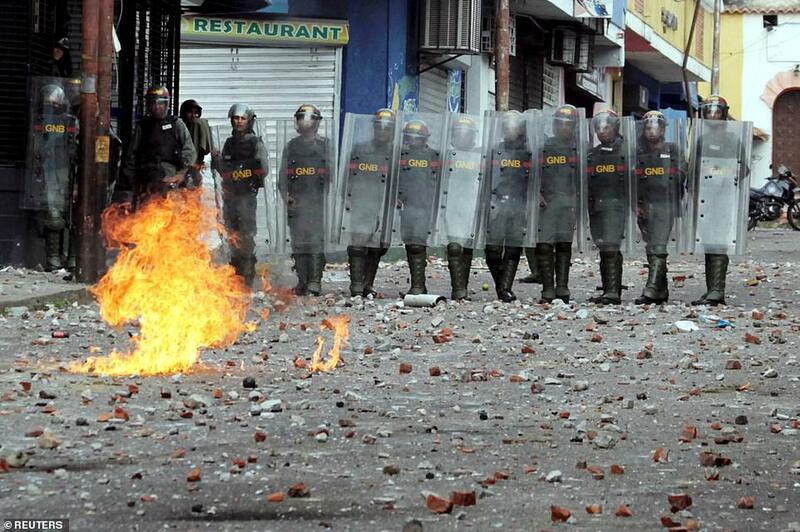 Which countries are supporting Venezuela’s opposition? 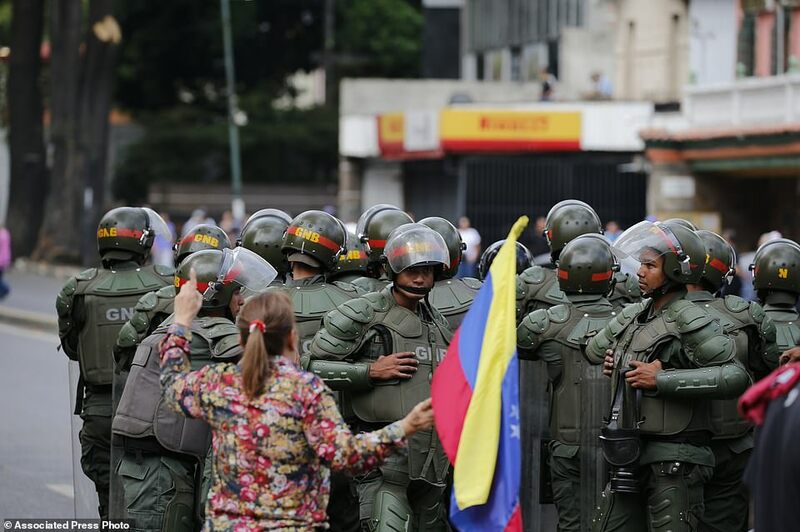 It capped three days of high tension that began Monday when a group of soldiers took over a command post in the capital Caracas and rose up against Maduro. 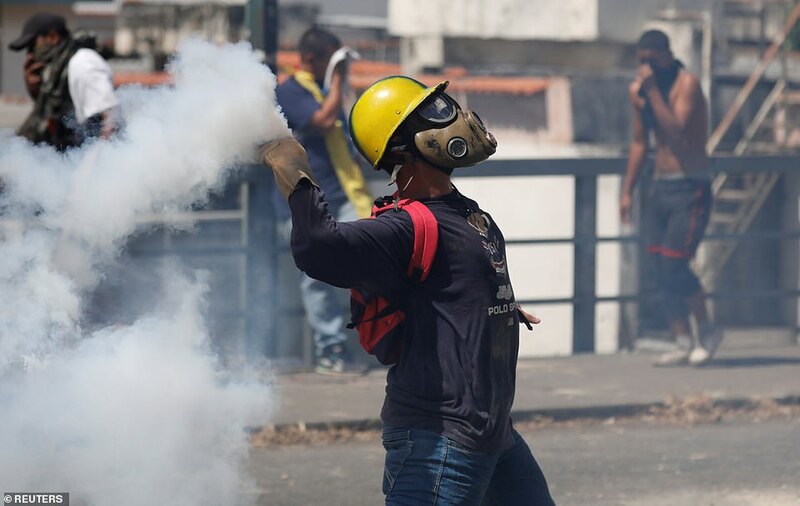 That was quickly quashed and officials said 27 people were arrested but it sparked a wave of smaller protests that were met by security forces using tear gas and rubber bullets. 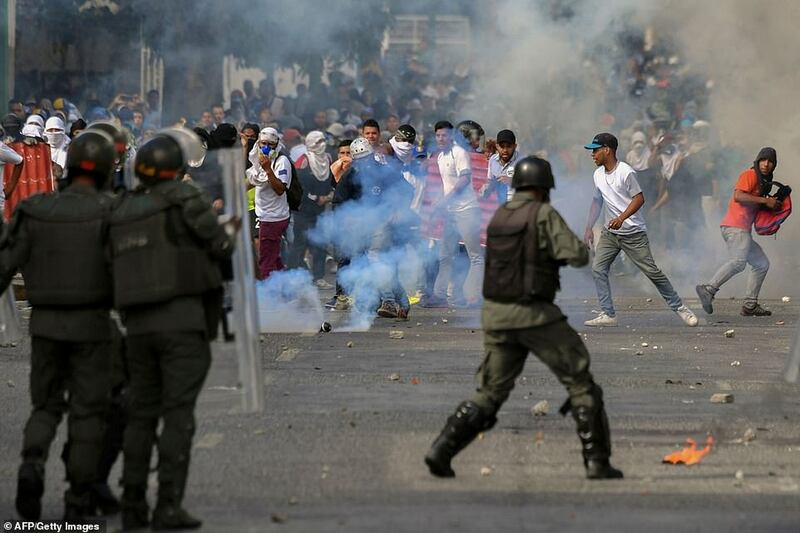 The Venezuelan Observatory of Social Conflict told AFP that 16 people have died in clashes over the past three days. An enraged Maduro responded by breaking off diplomatic ties with the ‘imperialist’ US government, ordering its diplomats to leave within 72 hours. 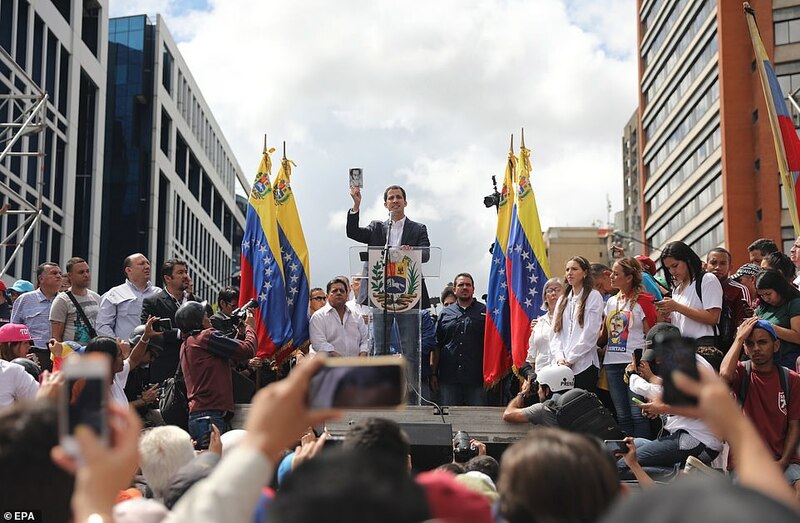 Defying Maduro, Guaido urged diplomats to stay put, in an open letter to embassies in the country. The Venezuelan president’s main financial backer China said it opposes ‘interference’ in Venezuelan affairs. 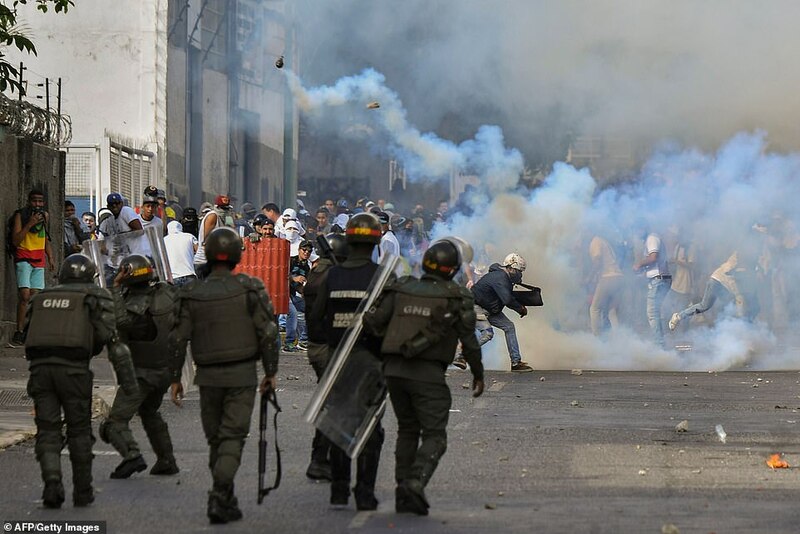 Wednesday’s mass street protests were the first in Venezuela since a crackdown on anti-government demonstrations between April and July, 2017 that claimed the lives of 125 people. ‘Trying to impose a government by extra-constitutional means, we cannot accept that,’ he said. 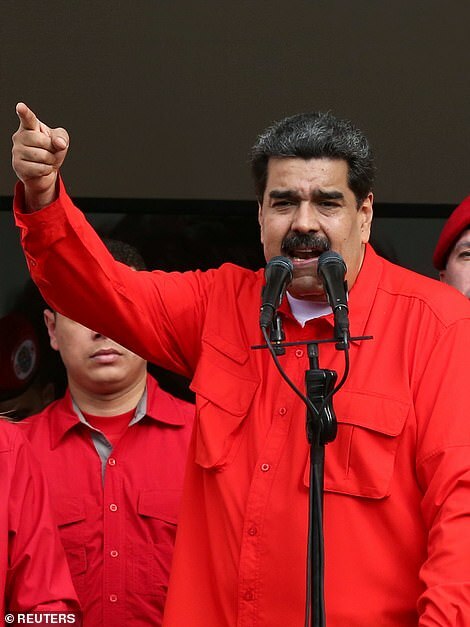 Maduro fired back at him by breaking diplomatic relations with the U.S., the biggest trading partner for the oil-exporting country, and ordering American diplomats to get out of the country within 72 hours. Washington has ignored the order, saying Maduro – described by the State Department as the ‘former President’ – no longer had the ‘legal authority’ to issue it. Trump’s announcement has also put him at odds with China, as Beijing – which has given Venezuela $65billion in loans and investment – called for Washington to stay out of the crisis. 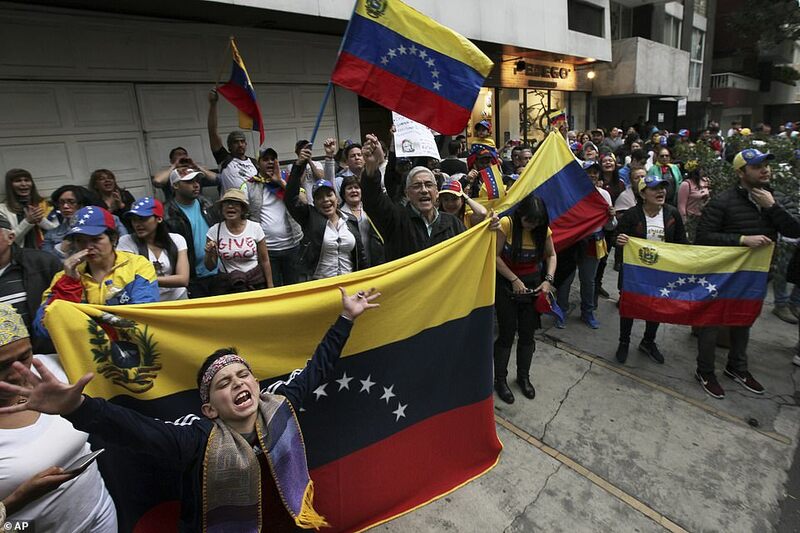 China ‘opposes the interference (in) Venezuelan affairs by external forces,’ the foreign ministry said. Maduro is also a strong ally of Syrian President Bashar Assad, whose government today condemned a ‘flagrant intervention’ by the United States. 1835: Washington establishes diplomatic relations with Venezuela, after the South American country gains independence from Spain. U.S. policy in Latin America is grounded in the Monroe Doctrine of opposing European intervention in the region. 1902: President Theodore Roosevelt defuses a crisis in Venezuela after European nations including Britain and Germany imposed a blockade over unpaid debts. His idea of an ‘international police power’ becomes known as the ‘Roosevelt Corollary’ to the Monroe Doctrine. 1914: Venezuela opens its first major oilfield, giving it crucial strategic value to the United States. Further oil sources are discovered during the course of World War I. By the late 1920s it was one of the world’s leading oil exporters. 1942: The country is granted $4million of military equipment under Lend-Lease during World War II. It is one of more than 40 nations offered aid in the scheme, which began before the U.S. entered the war. 1950: A U.S. State Department paper says: ‘All policies toward Venezuela are affected in greater or less degree by the objective of assuring an adequate supply of petroleum for the U.S.’. The document also lists Venezuelan iron ore deposits as being of strategic interest to Washington. 1959: Democratically-elected leader Romulo Betancourt takes power in Venezuela after the fall of a military dictatorship, and is, regarded by the U.S. as an anti-Communist ally during the Cold War. The countries remain broadly aligned until 1999. 1973: U.S. backing for a military coup in Chile – in which army chief Augusto Pinochet overthrows democratically-elected socialist Salvador Allende – becomes a symbol of Washington’s interventionism in Latin America. 1974: Venezuela restores diplomatic relations with Washington’s Cold War enemy, Cuba. They had earlier been cut off under Betancourt’s doctrine of denying recognition to undemocratic regimes. 1997: Bill Clinton’s White House describes Venezuela as a ‘close’ partner thanks to their oil trade, with a ‘strong mutual commitment to democracy’. For a time in the 1990s Venezuela is the largest oil exporter to the United States. It marks the last high point of Washington’s relationship with Caracas. 1999: Venezuela lurches to the left as anti-American socialist Hugo Chavez – who had attempted a coup in 1992 – becomes President. It is the start of two decades of worsening relations with Washington. 2002: Chavez is briefly toppled by a coup before returning to power. He accuses the United States of involvement in the attempted overthrow, claiming the CIA knew about it in advance. Loyalists in the military return Chavez to power after interim president Pedro Carmona dissolved the constitution. 2003: The Venezuelan leader opposes the American-led invasion of Iraq, saying in November that year it had led to ‘terrible destablization’ and violence’. The war escalates tensions between Chavez and George W. Bush. 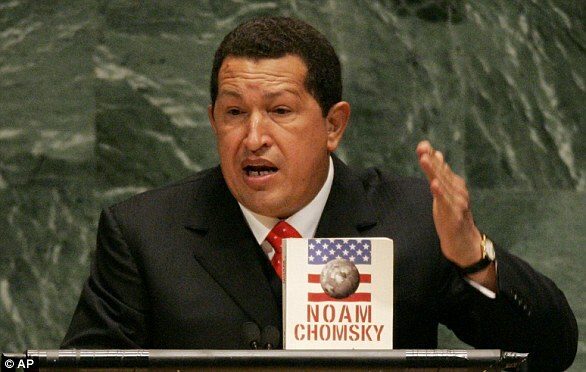 2006: President Chavez calls George W. Bush ‘the devil’ during a speech at the United Nations in New York, saying the podium still ‘smelled of sulphur’ after the 43rd U.S. President had spoken there the day before. 2009: Barack Obama meets Chavez in Trinidad and Tobago in a bid to improve relations. Obama, who had recently been sworn in, defends his ‘polite conversation’ with the Venezuelan leader but he is slammed by U.S. Republicans for bolstering ‘enemies of America’. 2013: Hugo Chavez dies on March 5, aged 58, just months after winning re-election to another term, defeating centrist candidate Henrique Capriles. Nicolas Maduro, running to continue his mentor’s policies, wins the resulting presidential election by less than two per cent. In his inaugural speech he attacks Washington’s ‘imperialism’. 2015: Obama declares Venezuela a security threat, accusing the country’s government of persecuting opponents, arbitrary detentions, violating human rights and ‘significant public corruption’. The U.S. Treasury Department also orders sanctions on seven named Venezuelan officials. 2017: Maduro forms a new Constituent Assembly to rewrite Venezuela’s constitution, seen as an effort to target and imprison opposition leaders. Opponents said the electoral system was rigged in favour of the government. The U.S. government does not recognise the assembly. 2019: Donald Trump recognises opposition leader Juan Guaido after he declared himself interim President. 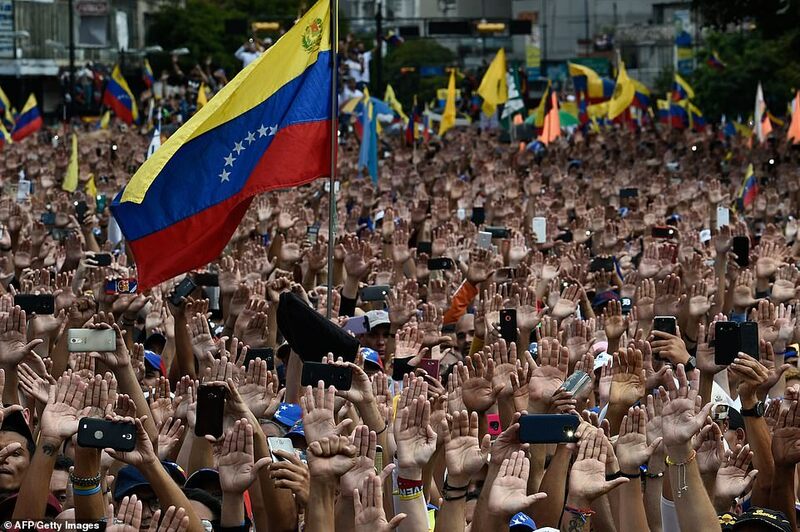 It comes amid nationwide protests after Maduro was sworn in for a second term following a disputed election victory in May 2018, which opponents said was achieved by vote-rigging. Maduro vows to fight on and is backed by the country’s military chiefs. Turkish President Recep Tayyip Erdogan – who himself survived a coup attempt in 2016 – has called Venezuela’s embattled president to voice his support. Iran has also denounced Guaido’s attempt to take power, saying he had tried to take power unlawfully in a coup. 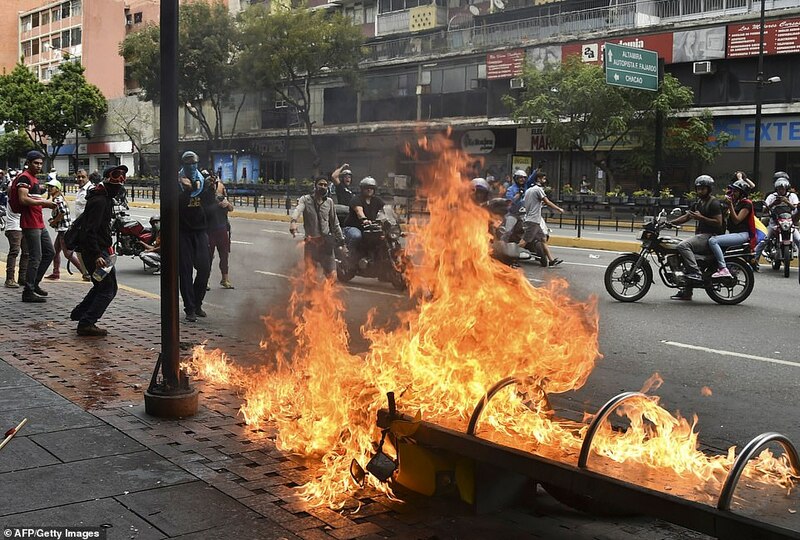 ‘Iran supports the government and people of Venezuela against any sort of foreign intervention and any illegitimate and illegal action such as attempt to make a coup d’etat,’ the foreign ministry said. 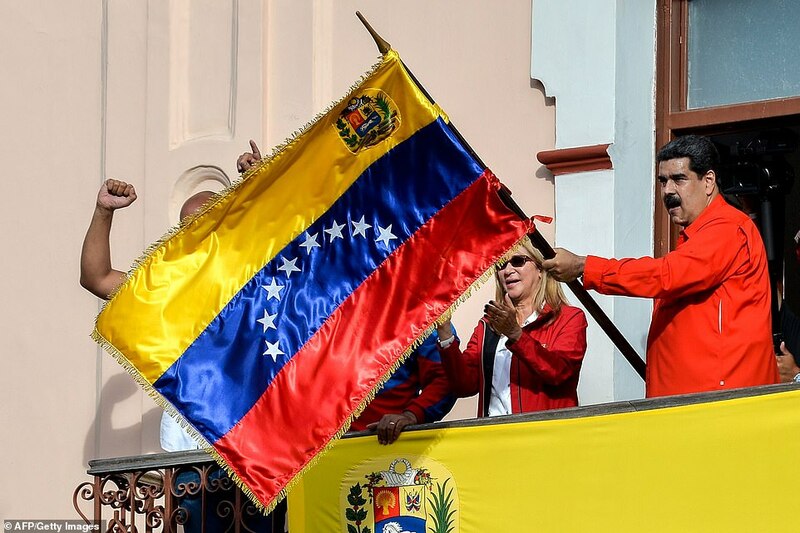 The European Union stopped short of recognising Guaido as President but called for new elections in Venezuela, with some of its leaders gathering in Davos this week. 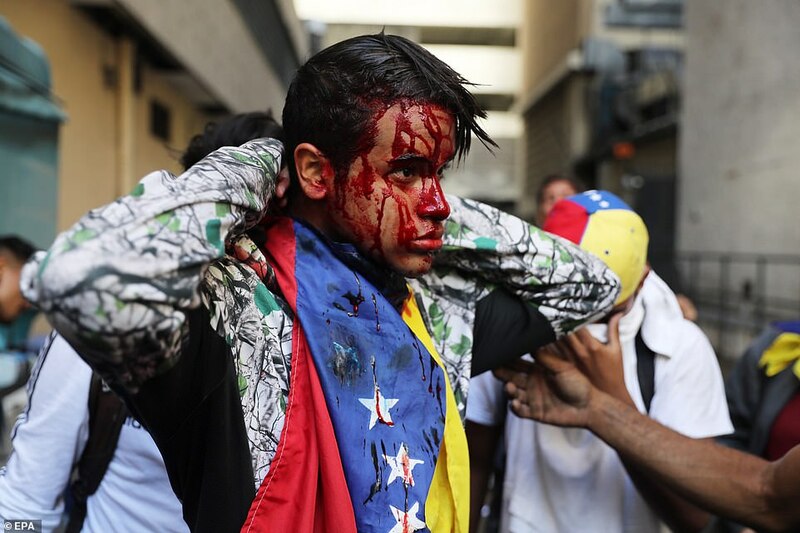 Brussels said the ‘interim’ President’s ‘civil rights, freedom and safety’ had to be ensured and called for the ‘restoration of democracy’ and in Venezuela. French President Emmanuel Macron called Maduro’s election last year ‘illegitimate’. Macron said he ‘salutes the courage of hundreds of thousands of Venezuelans marching for their liberty’. UK Foreign Secretary Jeremy Hunt gave Guaido his endorsement but stopped just short of recognising him as the new President. He said: ‘It is clear that Nicholas Maduro is not the legitimate leader of Venezuela. 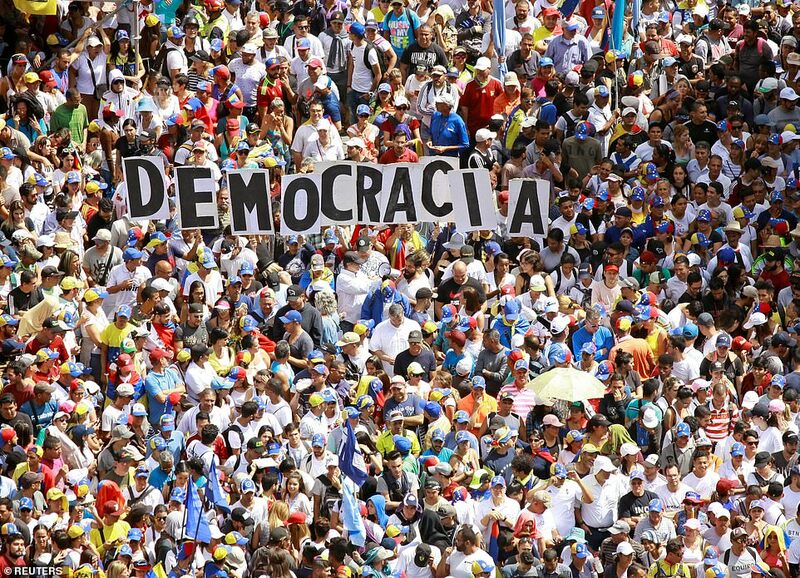 PM Theresa May’s spokesman earlier said: ‘The 2018 presidential election in Venezuela was neither free nor fair, so the regime’s basis for power is deeply flawed. ‘In relation to the US, we think it’s totally unacceptable for Venezuela to cut off diplomatic ties. ‘The Venezuelan government needs to respect the authority of the National Assembly. In Germany Angela Merkel’s spokesman praised the ‘courage’ of Venezuelans and called for a ‘political process’ with new elections. Portugal’s foreign minister also called for Maduro’s departure, saying he should ‘understand that his time has come to an end’. 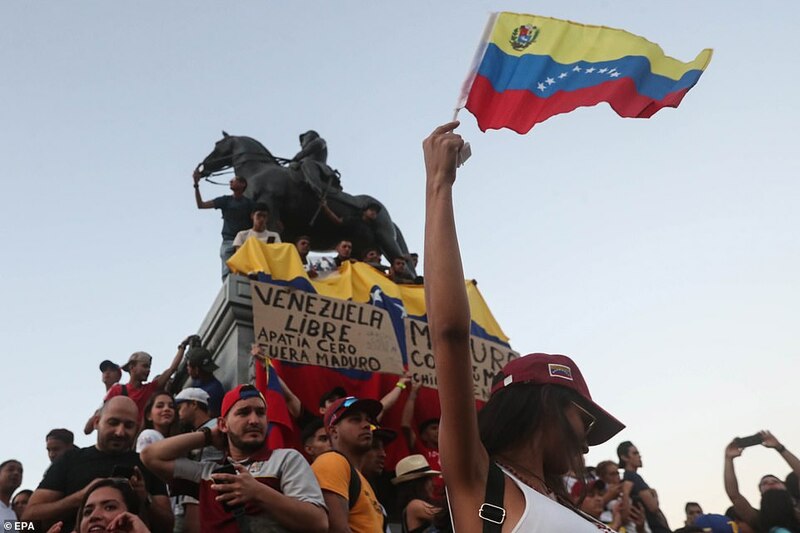 Spain said fresh elections were the ‘only way out’ for Venezuela, with some 200,000 Spanish nationals living in the former colony. ‘The scenario has changed radically, there have been deaths. We have to prevent the situation from worsening,’ Madrid’s foreign minister said. 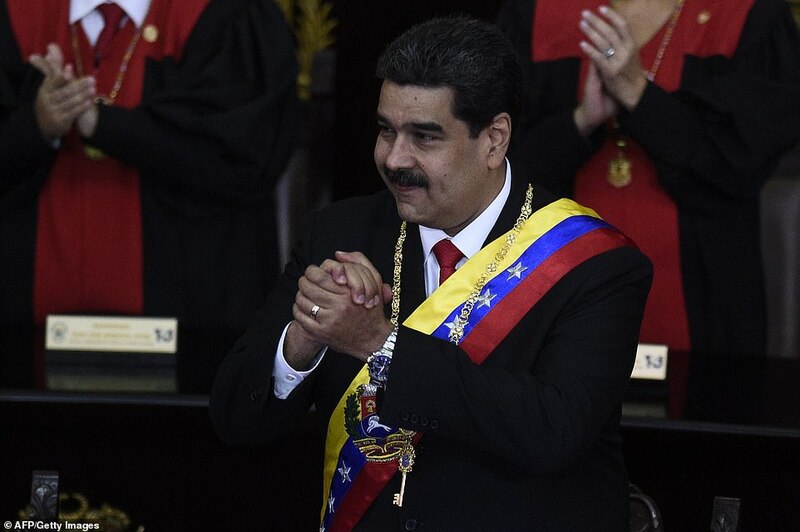 Maduro, who has been backed by government-packed courts and a constituent assembly as well as the Army, recalled the long history of heavy-handed U.S. interventions in Latin America as he appealed for support. 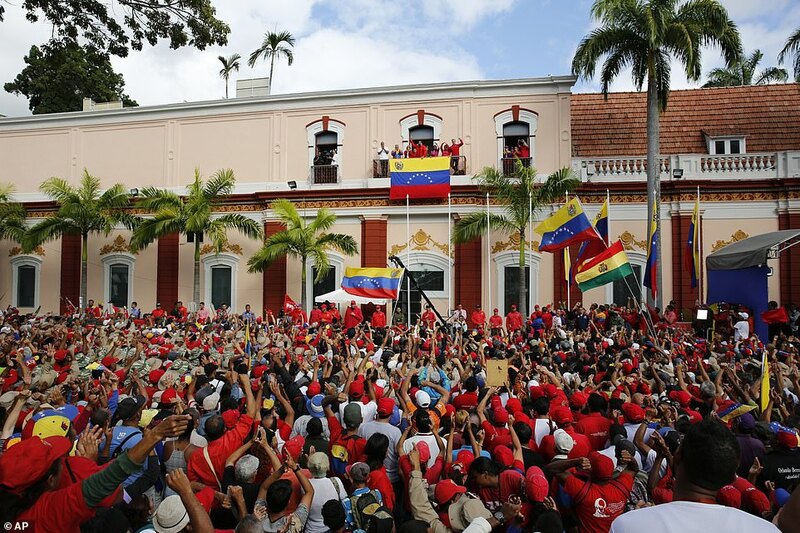 ‘Don’t trust the gringos,’ he thundered to a crowd of red-shirted supporters gathered at the presidential palace in Caracas. The countries were broadly allied in the Cold War, largely as a result of the oil trade. 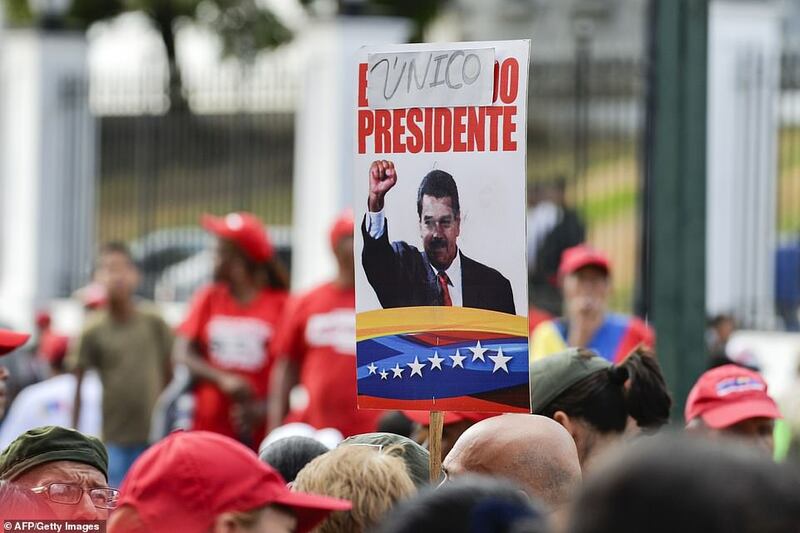 However they have clashed frequently since Venezuela swung to the left and Maduro’s mentor Hugo Chavez – who once called George W. Bush ‘the devil’ – became President in 1999. However Venezuela remains America’s third-largest oil supplier. 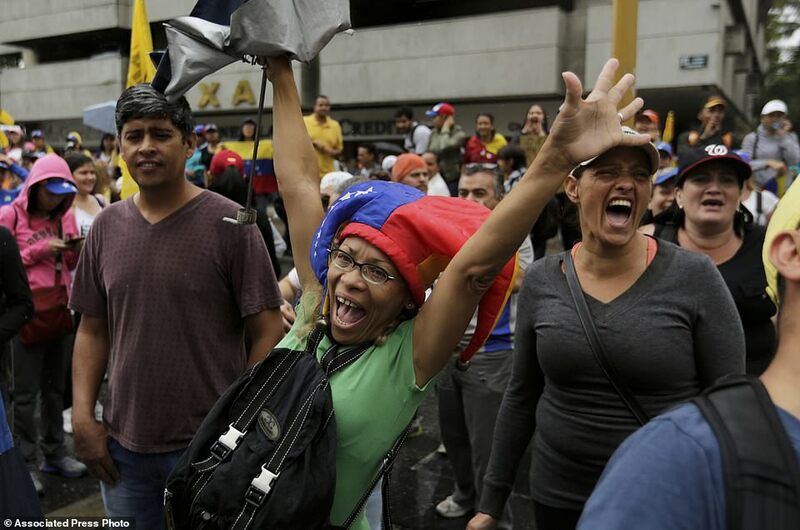 Tens of thousands gathered in the capital waving flags and chanting ‘Get out, Maduro!’ for the biggest assault on his rule since a wave of unrest that left more than 120 dead in 2017. 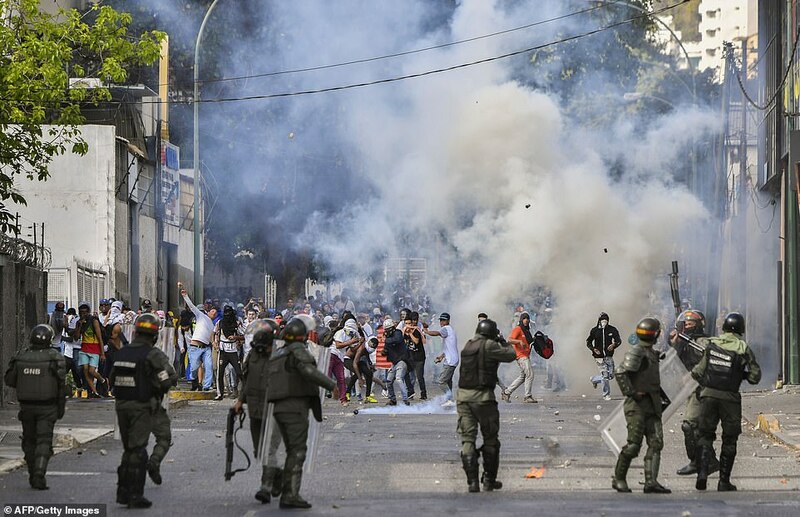 Four people were killed by gunfire in the city of Barinas as the National Guard broke up an opposition rally while three others were killed amid unrest in the border city of San Cristobal. Wednesday’s protests coincided with the anniversary of the 1958 coup that overthrew military dictator Marcos Perez Jimenez. Hours after most demonstrators went home, violence broke out in Altamira, an upscale zone of Caracas and an opposition stronghold. 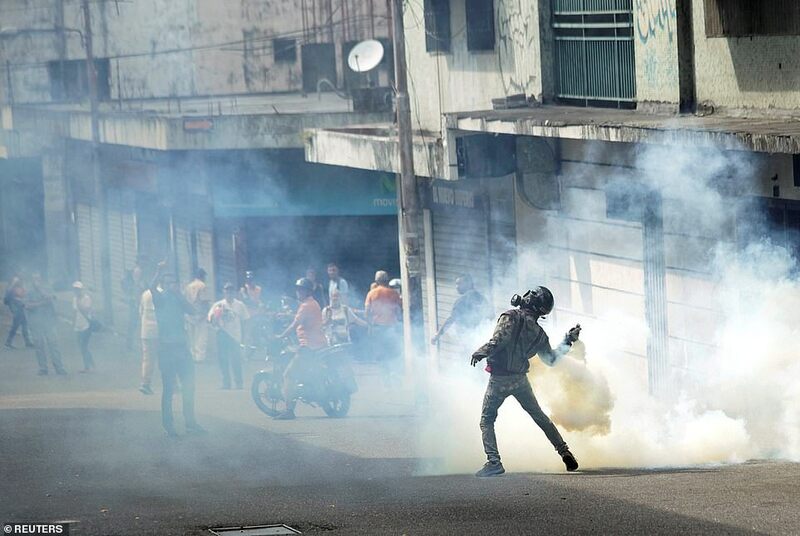 Tear gas canisters sent hundreds running and hordes of protesters riding two and three on motorcycles fleeing in panic. Blocks away, a small group knocked a pair of guardsmen riding tandem off their motorcycle, pelting them with coconuts as they sped down a wide avenue. Some in the group struck the two guardsmen with their hands while others ran off with their gear and set their motorcycle on fire. Pope Francis has arrived in Panama against the backdrop of the crisis in nearby Venezuela. 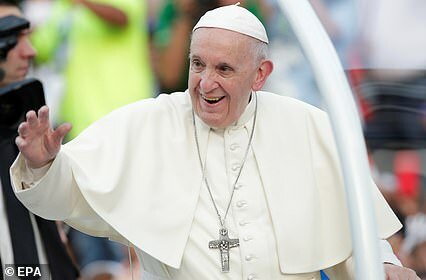 The pontiff will address Panama’s President and the region’s bishops today and all eyes will be on whether he refers to the upheaval in Caracas. Local bishops vocally oppose the socialist regime of President Nicholas Maduro, but the Holy See is keeping up diplomatic relations with the government. The Vatican’s charge d’affairs went to Maduro’s inauguration earlier this month. Francis flew from Rome on Wednesday just as the crisis was erupting in Caracas. The Pope will also face questions over the U.S.-Mexico border row amid a stand-off over the proposed wall. 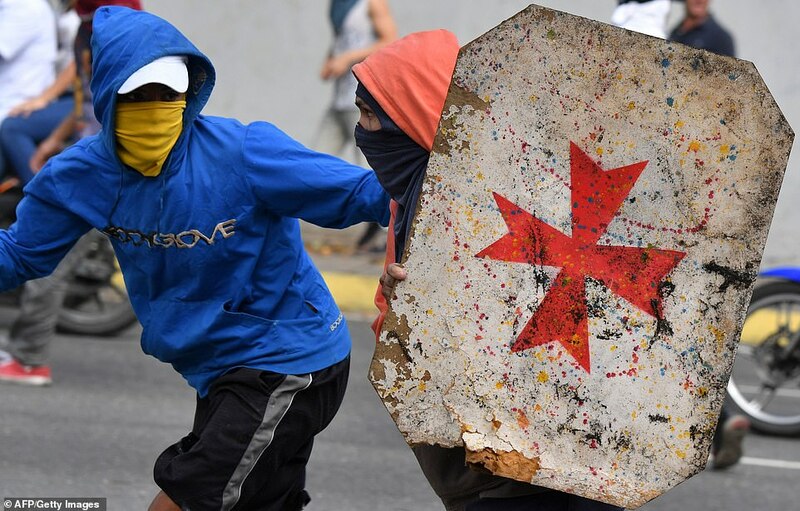 All eyes are on the military, the traditional arbiter of political disputes in Venezuela – and to which Guaido has been targeting his message. On Monday, a few dozen national guardsmen seized a stockpile of assault rifles in a pre-dawn uprising that was quickly quelled, although residents in a nearby slum showed support for the mutineers by burning cars and stoning security forces. 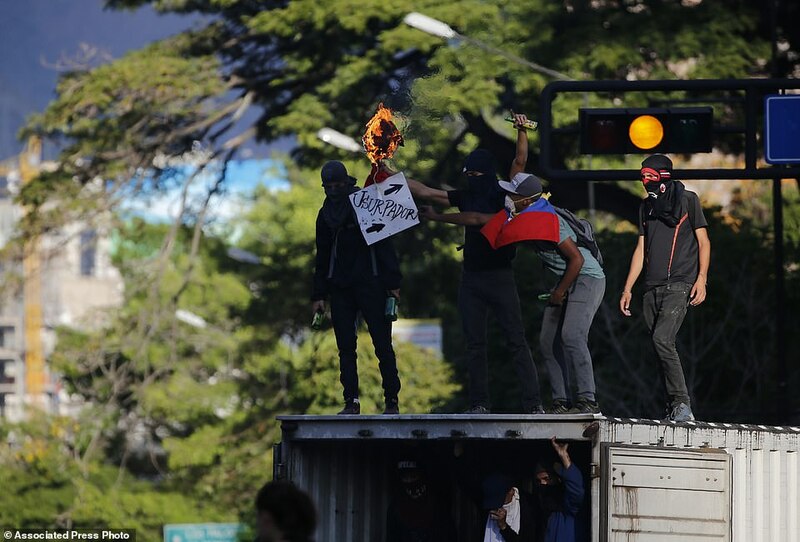 The protests also came shortly after Venezuela’s Supreme Court – dominated by Maduro loyalists – ordered a criminal investigation of the National Assembly for trying to depose the president. The National Assembly promised an amnesty to all members of the military who abandoned Maduro. 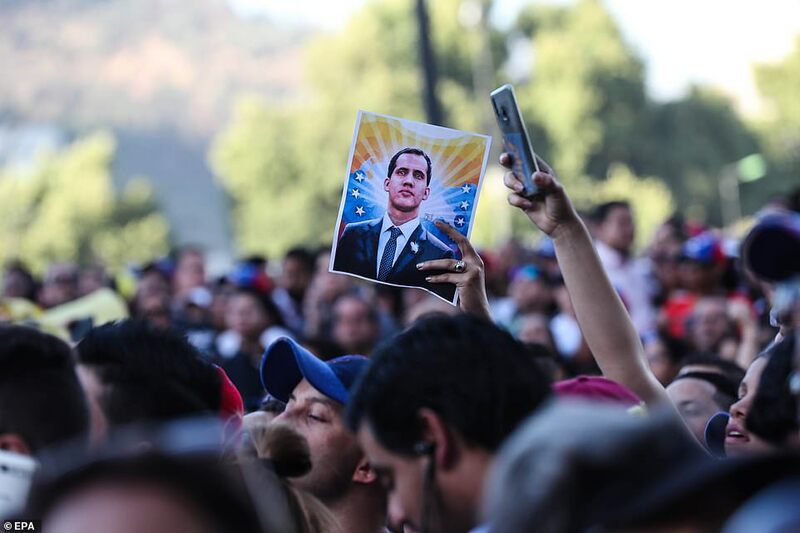 Guaido called the protests two weeks ago in a bid to rally support behind his aim to remove Maduro, set up a transitional government and hold elections. Today attention will shift to Washington, where diplomats at the Organization of American States will hold an emergency meeting on the Venezuelan situation. The debate promises to be charged, and the National Assembly’s newly picked diplomatic envoy will be lobbying to take Venezuela’s seat from Maduro’s ambassador. 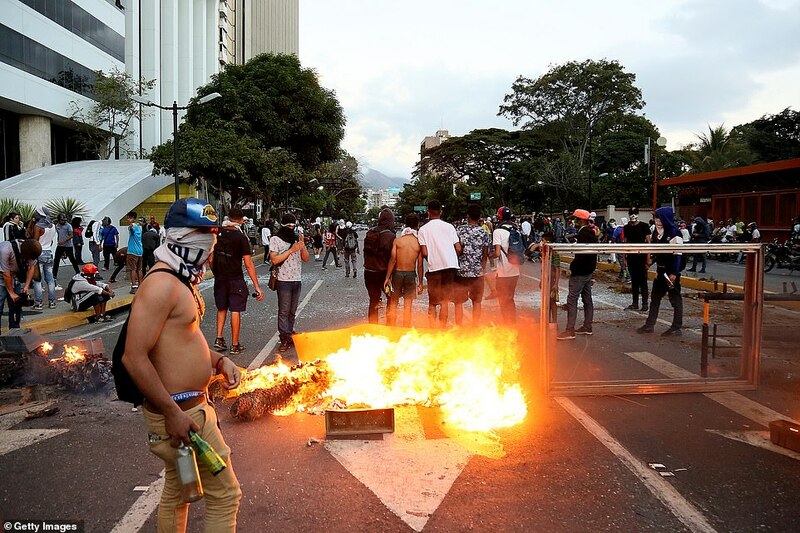 UN chief Antonio Guterres appealed for dialogue to avoid the political crisis spiralling out of control, saying he hoped to ‘avoid an escalation that would lead to the kind of conflict that would be a disaster for the people of Venezuela’. The country holds 17.9 per cent of proven oil reserves, ahead of Saudi Arabia at 15.7 per cent, Canada (10.0 per cent) and Iran (9.35 per cent), figures compiled by British oil giant BP show. But Venezuelan output has been hampered by chronic under investment by the nationalised oil company Petroleos de Venezuela SA. Potential U.S. sanctions against Maduro’s government or serious unrest in the country could cut the country’s crude exports further.